The PakLite® Trophy Kit from Buck Knives includes a lightweight 135 PakLite® caper and 141 PakLite® skinner with guthook constructed of S30V steel in a convenient compact sheath. Both knives were designed to make the task of harvesting convenient and hassle-free. 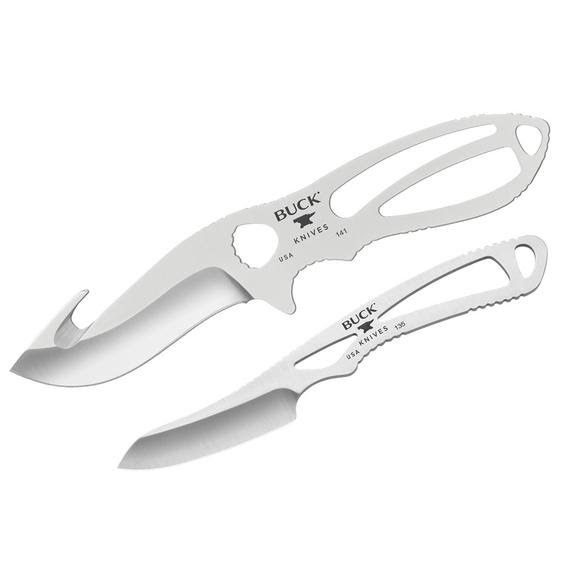 The PakLite® Trophy Kit from Buck Knives includes a lightweight 135 PakLite® caper and 141 PakLite® skinner with guthook constructed of S30V steel in a convenient compact sheath. Both knives were designed to make the task of harvesting convenient and hassle-free. The guthook allows the hunter to effortlessly cut through even the thickest hide without worrying about piercing internals or having hide bunch up. The caper&apos;s modified blade allows for precise, detailed work with ultimate control. The minimalist design makes the entire set lightweight and easy to carry. The PakLite® Trophy Kit is an essential piece to any hunter&apos;s gear. Guthook: 3 1/2" blade Caper: 2 1/2" blade. Made in the USA. Blade Length Guthook: 3 1/2", Caper 2 1/2"